A high-performance cocktail of exfoliants prompts a renewal process that is multilevel, time-released. Speeds fresh, vibrant cells to the surface. Continually unveils brighter, more radiant skin. Leaves skin with a velvety feel, perfected look. Apply twice daily. Follow with your regular moisturiser. Avoid eye area. Boost results with Turnaround Instant Facial 2-3 times a week. Water, cyclopentasiloxane, dimethicone, polysilicone-11, acetyl glucosamine, peg-10 dimethicone, salicylic acid, saccharomyces lysate extract, oryza sativa (rice) bran extract, polygonum cuspidatum root extract, acrylamide/sodium acryloyldimethyltaurate copolymer, castanea sativa (chestnut) seed extract, cholesterol, tocopheryl acetate, laminaria saccharina extract, triticum vulgare (wheat) germ extractyeast extractfaexextrait de levure, caffeine, adenosine phosphate, sodium hyaluronate, salvia sclarea (clary) extract, creatine, glycyrrhetinic acid, pantethine, ammonium acryloyldimethyltaurate/vp copolymer, hydrolyzed corn starch, squalane, glyceryl stearate, cocamidopropyl dimethylamine, hordeum vulgare (barley) extractextrait d'orge, ethylhexylglycerin, sodium citrate, hexylene glycol, butylene glycol, di-c12-18 alkyl dimonium chloride, polysorbate 80, caprylyl glycol, polysorbate 20, isohexadecane, disodium edta, phenoxyethanol, titanium dioxide (ci 77891), mica, iron oxides (ci 77491, ci 77492, ci 77499). Kept my skin hydrated. Easily absorbed. I didn't notice any "turnaround" effects on my skin, it pretty much stayed the same. The generous sample I tried of this is labelled "visible skin renewer" but after some internet research, this seems to be the same product as the radiance renewer. 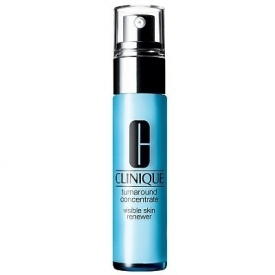 I also discovered that it is a serum, which is good as this is how I used it. The scent is inoffensive and quite low-key for Clinique. The texture was nice and smooth and easily absorbed. It kept my skin moisturised after cleansing but I didn't notice that my skin had been "turned around", "visibly renewed" or any "renewed radiance". For the price, I would expect something more.